We produce special grades bolting for steam and gas turbine engine. Grades such as 718, 660 class A/B/C/D, SS321, SS410, B4B, B8M class 2, B7, B16 and etc. for extreme environment. Raw materials are stocked in our special automated retrieval system for full traceability records which meet the turbines requirement. 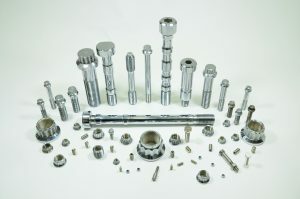 Special coatings like silver plating, Electroless Nickel are performed on bolts and nuts and machining items.